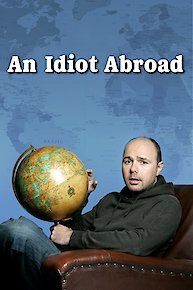 An Idiot Abroad is a comedy travel show first airing on Sky1 and starring Karl Pilkington, a man who first came to prominence as the producer of the XFM radio show The Ricky Gervais Show. Pilkington became well known on the show for an outlook on life heavily shaped by his complete obliviousness to many aspects of culture and a decidedly simplistic understanding of how the world works. The series hinges on the premise that Pilkington is being forced by Gervais and his writing partner Stephen Merchant to travel the world and experience other cultures and lands he would otherwise have no interest in seeing, all while the two comedians monitor his progress from back home. Karl and Warwick finally make their way to China. But a surprise ending proves to be quite a high. Karl and Warwick continue their travel to India. Laughing yoga and parts in a Bollywood film are trumped after Karl experiences his first holiday highlight. In the third season premiere, Karl and Warwick Davis follow the path of Marco Polo and begin their adventure in Venice. Karl meets up with Ricky Gervais and Stephen Merchant after returning home. He reminisces about his experiences. Karl goes to Mount Fuji in Japan for a 15 hour trek to the summit. Karl travels along the historic Route 66 in America. Stops include a 'cuddle party' with new-age therapists and wing-walking. Karl heads of to Africa to go meet a Gorilla. Before he travels to Uganda, Karl agreed to start in South Africa as he's be en there on holiday he heard it was alright. Karl visits rebuilds a shelter in the slums and meets a family pet hippo. Ricky and Steve are in Alaska dog sledding and whale watching. Pilkington goes down under to swim with dolphins. This episode Pilkington takes the Trans-Siberian Express, which starts in Russia, goes through Mongolia and ends in China. This season Pilkington's adventure begins on a South Pacific desert island (Vanuatu). An Idiot Abroad is currently available to watch and stream on Science Channel. You can also buy, rent An Idiot Abroad on demand at Amazon, Vudu, Google Play, iTunes online.